Our products include many fine details that cannot be produced by machining, so nearly all of their finish processes are performed by hand. With the skilled touch of a craftsperson surpassing the accuracy of measurement by digital instruments, furniture can be completed to be even more faithful to the original works. Our products strike a balance between machining and hand-crafting in their production processes, to bring out the best of designs with many strong craftwork elements. These works are finished to be uniform on all sides, to ensure that their gentle sensation when touched by the hand is not lost. 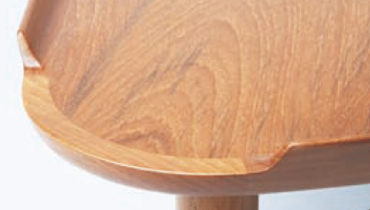 Designs with clean and delicate appearances can be achieved by a production method that resembles “joinery”. Precision of such a high level as to approach perfection is demanded. Bringing out curving and complex shapes to the fullest, hand-sewing is used to complete items of the highest grade, which are then finished with delicate materials such as natural leather. Our products are able to accommodate any orders, requiring painstaking stitch-by-stitch work but yielding gentle forms with exquisite artistry. 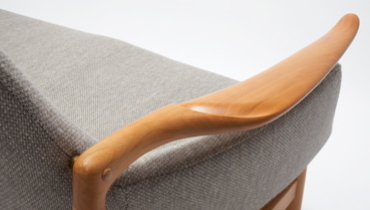 The undersides of our chairs are finished every bit as carefully as their surfaces. 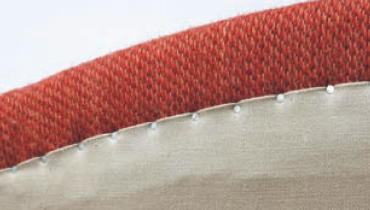 Of the many different finishing methods used, the photograph shows the upholstery of underlining materials with nails. 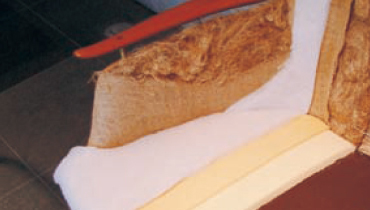 Our cushion materials consist of a combination of natural materials and urethane foam. 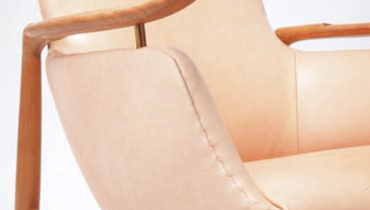 They are arranged uniquely by Kitani to match each chair’s design and functions. 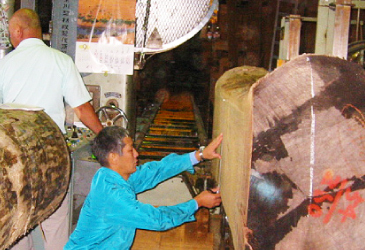 Wild cherry and black walnut wood is obtained in the form of logs, which are then sawn and dried by Kitani. 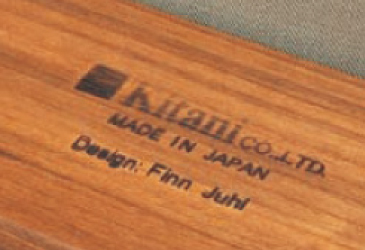 This is because Finn Juhl and other products make lavish use of wood materials, so wood that is sawn and dried at its sources would not have sufficient thickness. 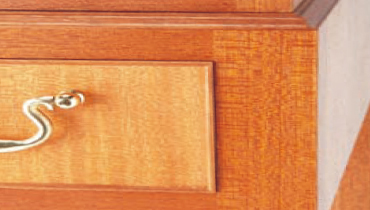 A method known as vacuum drying is also used to bring out the fine beauty of the wood grain.